Every year I force my husband to dress in a couple’s costume that I make. 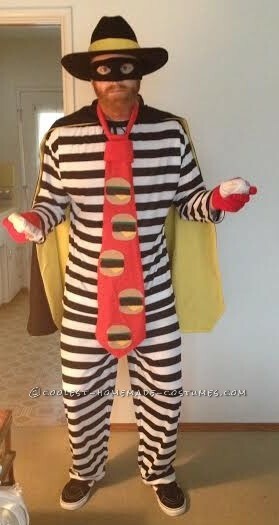 This year he came up with the idea to be one of his favorite childhood characters, the Hamburglar. I saw a picture of a crocheted hamburger dress on line and decided I would be a hamburger. I can’t crochet, but I can sew. 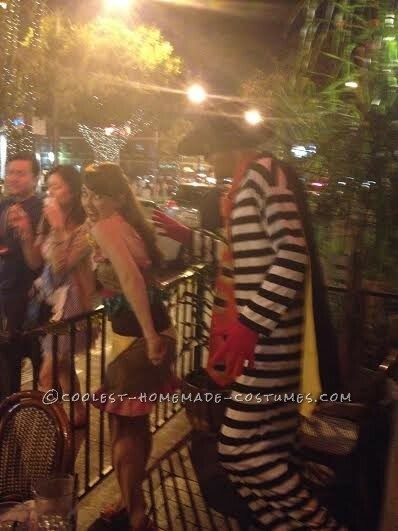 The Hamburglar costume was pretty simple to make. The hardest part was finding the correct size of striped fabric. I thought black and white stripes would be easy, but I had to scour the internet and place a special order to get the right one. I made the top and pants from the striped fabric. The cape was made from solid black and yellow cotton fabric. I made the tie out of red fleece and cut out hamburger shapes from felt and glued them on the tie. For the accessories I found a pair of cheap red gloves at the fabric store and we used my husband’s cowboy hat with an added a strip of yellow fabric for Hamburglar hat. 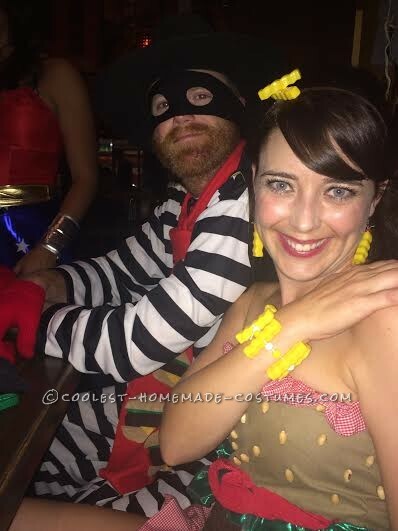 My husband bought hamburgers from McDonald’s on Halloween for his props. 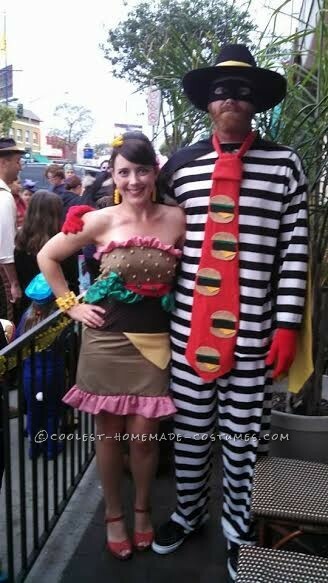 For my hamburger costume I used an assortment of fabrics in different textures from my fabric stash. 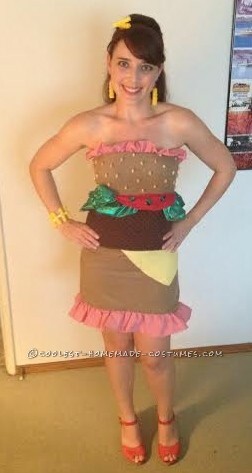 I used a dress pattern as my starting template and modified it into three sections to use for the buns and hamburger. For the lettuce I made a ruffle and twisted it as I hand sewed it in place so it would have a 3D effect. I added orange triangles for the cheese and half circles of red fabric for the tomatoes. I hand sewed wooden beads to the top half of the dress for the sesame seeds. For my accessories I found a box of toy food in the kids’ toy section that had french fries in it. I was very excited with my luck of finding them. I poked holes in the french fries to make a bracelet and earrings and glued some to a headband for my hair accessory. On Halloween, when we out, you could tell the young from the old by their recognition of who we were.